The mood struck me tonight for a one pot dinner. As I mentioned in my previous post, I’m not the most organized cook and tonight wasn’t the night for a major cleanup. I lucked out recently and purchased a 14-inch Lodge cast iron skillet at a ridiculously low price. I had not put it to good use yet so I scoured the fridge looking for the perfect set of ingredients to break in my new pan. I know everyone is all about boneless and skinless chicken these days and granted, that’s what I usually buy. However, I’m of the mind that skin and bones add tremendous flavor to chicken and sometimes I throw caution to the wind and go for the intact fowl. Thighs, in my opinion, impart the most flavor of any part of the chicken and two packs sat patiently on the self waiting for their night on center stage. 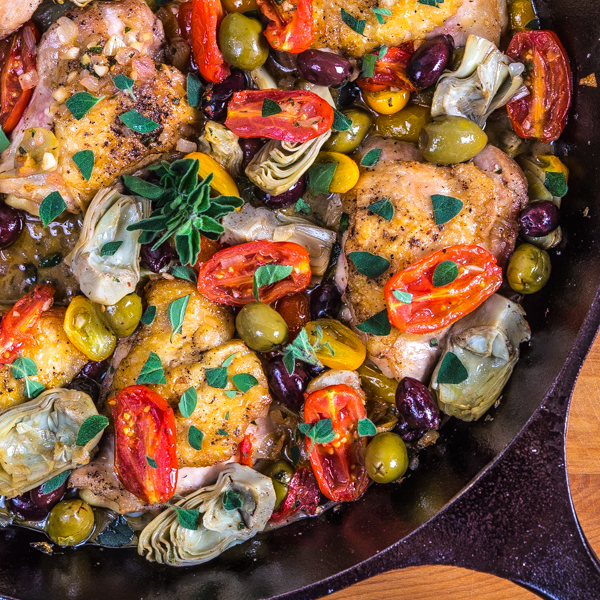 A good supply of olives, frozen artichoke hearts, oregano, and yellow and red grape tomatoes grabbed my attention when I opened the refrigerator and I didn’t delay in deciding that my new, gigantic skillet made the perfect vehicle for Tuscan-inspired chicken. This dish starts on the cooktop and finishes in the oven and comes together in under an hour. And, the best part is you can make it without creating a big mess! 2. Heat olive oil in a large oven-proof skillet over medium high heat. 3. Salt and pepper both sides of chicken thighs. Transfer chicken to skillet and brown for five minutes on each side. Remove chicken and set aside. 4. Add shallots and garlic and saute for three to four minutes. Deglaze pan with wine, scraping to loosen the brown bits. Add tomatoes, artichokes, olives, one teaspoon salt, one half teaspoon pepper, and one tablespoon of oregano. Saute for two to three minutes. 6. Garnish with one tablespoon oregano and serve immediately. What an absolutely beautiful skillet dish!!! I love my Lodge cast iron skillet and I can see this dish being cooked in it very soon. Just bought a bunch of chicken thighs so I’m ready. Great dish! This Tuscan chicken is so gorgeous, Bill! I love all those Mediterranean flavors you’ve got going on in here. Definitely going to try it sometime soon! Thanks for sharing. I’m hypnotized by the captivating look and heavenly fragrant aroma of your chicken dish! Such amazing clarity, ridiculously gorgeous color of all the components in the pan took my breath away! You are a rockstar photographer in my eyes. And your passion for cooking shows in your photos. I love dishes that start on the stovetop and finish in the oven! And this one looks spectacular. Love all the colors. I agree about skin and bones, BTW. In the scheme of things, the skin really doesn’t add that much added fat or additional calories, and is so filling. Anyway, good recipe – thanks. So glad I discovered your blog with great recipes and fun to read. The Tuscan chicken looks amazing, so do the colors! Love all the Mediterranean flavors in this dish! Bill – what an amazingly colorful and flavorful dish! Those olives and artichoke hearts with chicken – yum! Olives make any chicken dish better — and I’m a fan of thighs as well. Looks delish! Bill, this looks unbelievable! Can you ship me some for dinner tonight? I DEFINITELY have to make this!